By William Mackay: Freddie Roach is once again making an outrageous prediction, this time with his prediction that his fighter WBA light welterweight champion Amir Khan (25-1, 17 KO’s) is going to destroy IBF light welterweight champion Zab Judah (41-6, 28 KO’s) in the early rounds of their fight on July 23 at the Mandalay Bay Resort & Casino, in Las Vegas, Nevada. If Roach is telling the truth about Khan going at Judah we could see a replay of Khan’s 1st round knockout loss to Breidis Prescott. Khan’s chin is too fragile for him to try and overpower Judah the way that Manny Pacquiao tends to run over his over-matched opposition. Khan doesn’t punch hard enough and with his glass jaw, it would be making things easy for Judah to land one of his big uppercuts. Roach knows this and is probably trying to throw Judah off by saying one thing and having Khan do something completely different. Khan will likely run for the hills in the first six rounds against Judah to prevent from getting hit with something big while Judah is still fresh and powerful. Roach knows that Judah wears down as the rounds go by, and it would be insane for him to tell Khan to go right into the teeth of Judah’s offense to try and take him out. It would be an admirable thing to do, because Khan would win more fans in the United States if he could somehow beat Judah this way instead of running and stinking up the joint the way he did against Marcos Maidana. 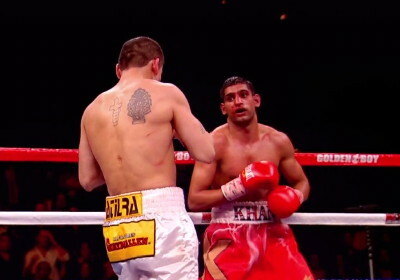 However, Khan won’t attack Judah because if he does it will lead to Khan getting knocked out again.